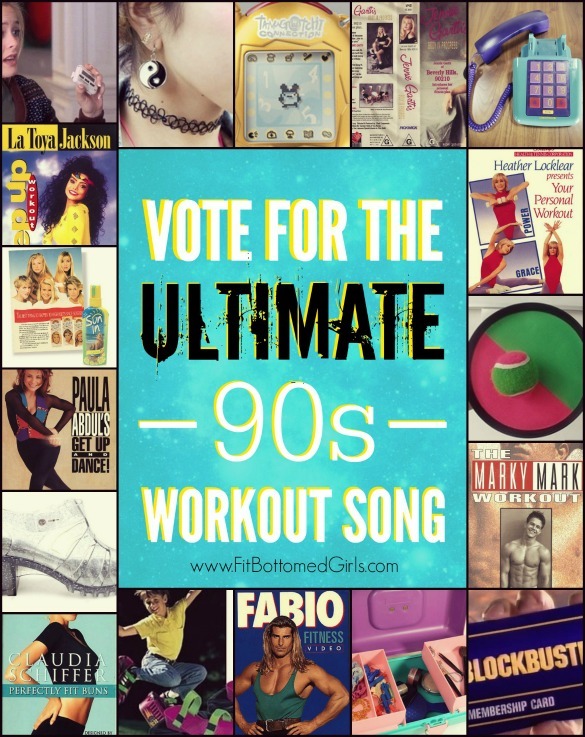 What’s Your Favorite 90s Workout Song? Cast Your Vote! Earlier this year, we asked you to help us figure out the ultimate 80s workout song, and boy, did you ever deliver! We had a blast watching the brackets whittle down to a winner week after week, and it sounded like you did, too. In fact, we had such a great time, we’re doing it all over again for what might be an even more epic workout music decade — the 90s! First things first — we’ve gotta narrow down all the amazing songs from that decade to just 64 in order to set up the brackets, and that’s too big a job for us to tackle on our own. So, we’re asking you to step in and select the 10 songs from the list below (or click through and fill it out here if you prefer!) that you think are the greatest 90s workout songs. Once we’ve gathered all your votes, we’ll take the 64 most popular songs, seed them by number of votes, and create a bracket, just like we did for the 80s. And each Friday, we’ll open voting for a new bracket or a new round of amazing 90s workout songs — we’ll keep rocking through ’em all for the next few months until we have a winner! Whatcha waiting for? Go ahead and select your faves, and we’ll be back in a couple weeks with the bracket (and first round of voting!). Songs are in alpha order by artist (and “The” counts as “T”), and you can only choose up to 10 — if you select more, you’ll get an error until you narrow down your selections. However, you do have the option to write in up to two songs that didn’t make our list — just be sure to scroll down all the way to the bottom. Happy voting! *This list is made up of songs that topped various charts (pop, hip hop, dance) from the beginning of 1990 through the end of 1999, plus a few FBG faves we couldn’t possibly leave out. In some cases they might’ve been released just before 1990, but we’re picking no nits on this. Good tunes are good tunes, yo! It seems you gave the whole playlist of 90s GYM music. I really Enjoy music while doing soft workout at my home. I usually listen to modern music which inspire me a lot. I don’t how it will be 90s music but still interested to give a try for the sake of my curiosity. Just thanks for this huge collection of “Old is Gold” workout music collection.